Every month I stalk the Jenni Bowlin Studio website to see what the monthly kit will include and whether or not she's added any new items to the store. Lately, my urge to order has been eased by knowing that Archiver's carries many of her products. However, when I saw the December kit, I just loved it. It wasn't really Christmas-y although it did have a lot of Christmas colors in it. It was hard to pass up the kit! 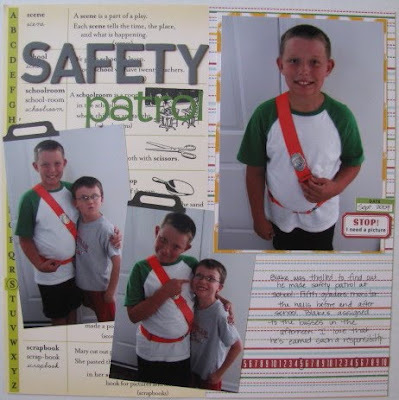 I completed a non-Christmas LO using pics of Blake the day he came home and announced he'd made Safety Patrol at school. I added Thickers and Scenic Route stickers from my stash. I wanted to document our Christmas card this year and our letter, but didn't feel the need to have a traditional layout. 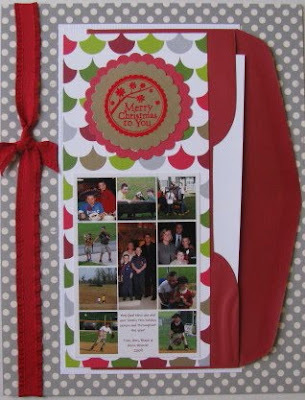 I kept it simple with just a patterned paper background with our card overlapping an envelope like I used to mail our cards. I left the envelope open so our letter from this year can be removed and read. To finish it off, I added a red ribbon down the side of the page. There was a challenge on a board to do a year in review LO. 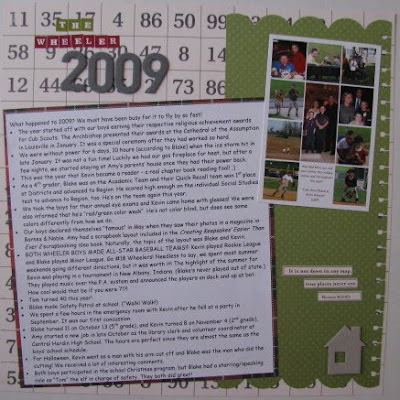 I did this LO for Blake using our Christmas card letter (cropped slightly) and the photo collage I included on our card. It's a great way to summarize the year for him. LOVE, LOVE, LOVE this page!!! (I don't mean to brag - really!) The map of Canada on the October Afternoon paper had me stumped a bit until I realized there were a lot of waterways on it. 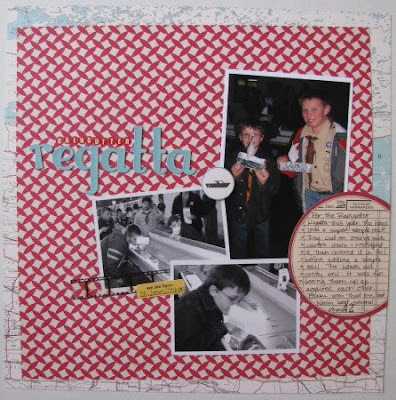 Waterways...boats...my Raingutter Regatta layout was born. This page for Kevin just makes me smile. The boys made their simple boats with Tom and they worked quite well! This layout really documents a memory I don't want to forget. I've eaten Krispy Kreme donuts my whole life, but they've always been purchased in a store. Every time I go to the mall in Louisville, I pretty much drive right by them. For some reason, after my birthday dinner, I decided to stop with the boys to check it out. It was cool seeing them make the donuts. We picked up 20 mini donuts for breakfast the next morning. When we got home, I snuck a bite of one and couldn't help myself - "Oh. My. Gosh!" Blake asked me what I was talking about and I gave him a bit of the donut. His eyes got huge and he repeated what I'd said, "Oh. My. Gosh!" But he continued, "They're like heaven...God's gift to us." 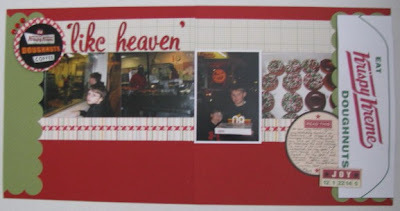 Oh, and yes, that's a Krispy Kreme hat in the layout, too. We've made one more trip since then to get fresh donuts and one morning when I had a craving, I even stopped at the gas station by school to buy one. But they only sold half dozens. But, I bought them. And ate three... They weren't quite heaven, but they were still good.